The Tufts women’s track team traveled to Conn. College for the Silfen Invitational on Friday and Saturday. The Jumbos managed to finish second out of 19 competing schools while providing their younger athletes with valuable experience across multiple events. The weather in New London, Conn. proved to be excellent for the Invitational, with mostly sunny skies and minimal wind. In these favorable conditions, the Jumbos posted three first-place finishes, one second-place, and a pair of third-place results. Overall, the team registered 12 top-five finishes. With the performance, Tufts earned a total of 89.5 points — well behind Stonehill’s 189 points and ahead of host Conn. College’s 82. Two athletes were responsible for the Jumbos’ three championships. On the first day of the meet, senior co-captain Brittany Bowman won the 5,000-meter run in a time of 16:42.30. The Camden, Maine native’s mark is currently No. 1 in all of Div. III. Bowman, the current national indoor champion in both the 3,000 and 5,000 meters, was pleased with her performance on Friday. Several other Tufts athletes also challenged themselves at Conn. College. Sophomore Julia Gake ran the 400-meter dash in 59.28 seconds to take third place in the event. Junior Sharon Kelmar registered a 10’2″ (3.10 meters) leap in the pole vault competition — her career-best mark. A group of new faces also turned in a strong performance in the 4×800-meter relay. First-year Emma Dzwierzynski, sophomore Lydia Heely, first-year Jacqueline Kirk and sophomore Jennifer Krupa combined to run a time of 10:07.26, which was less than a second slower than second-place Conn. College. Tufts coach Kristen Morwick was pleased with the quartet’s performance in their first major appearance. However, it was senior co-captain Annalisa DeBari who truly starred for Tufts over the weekend, winning two titles. DeBari claimed first place in the 200-meter dash with a time of 25.63 seconds. Later, the Melrose, Mass. native won the 100-meter hurdles in 15.06 seconds. DeBari’s strong performance was especially notable at a meet with so many of the team’s young runners, for whom the co-captain set an impressive example. The Jumbos also received other notable results in the field events. Senior Jennifer Sherwill took fourth place in the discus throw with a distance of 120’11” (36.85 meters). Junior Kylene DeSmith earned fifth place in the triple jump, leaping 33’8 ½” (10.27 meters). 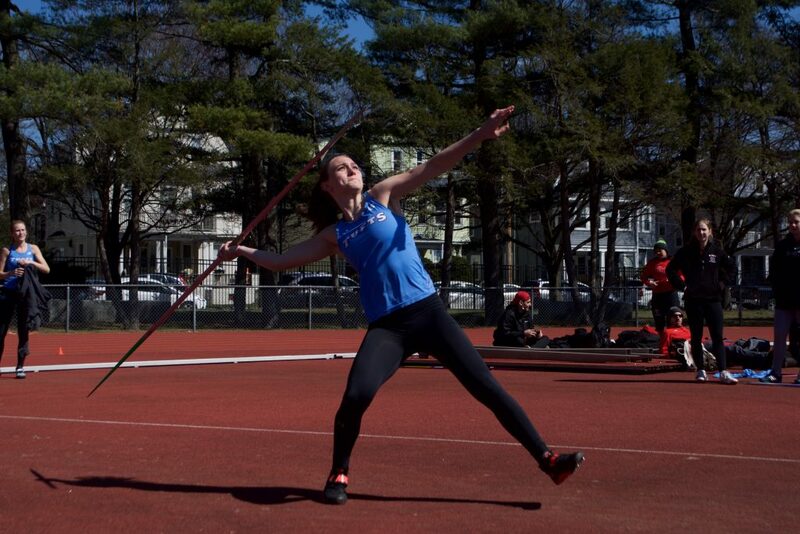 Finally, sophomore Erin Logee finished fifth in the javelin throw with a mark of 108’2″ (32.97 meters). Looking ahead, Tufts will host the Sunshine Classics on Saturday before traveling to Trinity for the NESCAC Championships the following weekend. The month of May, with New England Div. III Championships and NCAA Championships, is also on the horizon. The Jumbos hope that investments in their youth cadre, such as those at the Silfen Invitational, will pay off as the meets become more consequential.